Tester: Asian (Thai) about Lucy Liu's complexion with dark brown eyes. This shade is from the NARS Spring 2009 collection. "At first glance this may look like a standard pale pink and champagne/beige duo, but as with most of NARS products, there is always a bit more than meets the eye. The colors both have a significant amount of pigment, so the pink is actually a bit deeper than it looks in the pan, particularly if it is layered, as I did on several occasions. The beige shade actually has a fair amount of gold. They are both shimmery and have a touch of glitter as well. I thought these were extremely flattering, and best of all, I could achieve a nice neutral look that had a bit of kick to it on any given day. The formula was creamy and silky and was very easy to apply and blend. Note: There can be some glitter "drift" with this duo, so take care if using it as a liner or very close to the base of the lashes. The colors were long lasting and did not crease of flake during the day. This is a lovely spring pastel duo that is enhanced in a really subtle yet unique way. These shades will work best up to a Leona Lewis complexion. 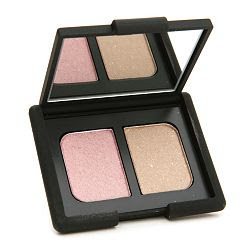 If you are looking for a nice eye makeup item to spruce up your look or you're just a NARS fan you must have this in your collection!" L.N.